Editing your book can be both time intensive and costly, but should not be skipped. The Write Publish Sell team sat down with a panel of professional editors and asked them to give us their best tips for preparing your manuscript for an editor. It’s our pleasure to share these tips for you. 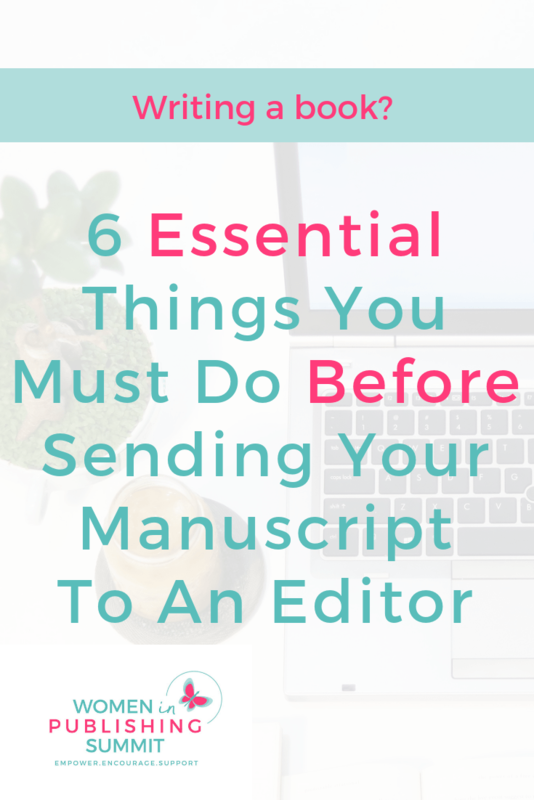 You will save both time and money if you take the time to to proofread your work before you send it off to your editor. Check for grammatical errors, spelling and typos. If you correct those easy mistakes, your editor won’t have to do it for you, which saves you money. “Go through that manuscript with a fine tooth comb before you’re paying for something you don’t need to be paying for, says Jodi Brandon of Jodi Brandon Editorial. Cut out all of the non-words. Non-words are words that don’t actually add to the value of what you’re trying to say. Words such as really, just, that and very are a few examples. Even though you think it adds emphasis to your sentence, in fact, it really takes away from your sentence and adds repetitiveness to your manuscript. If you take the word out of your sentence and it still makes sense, take it out. Here’s an example. She was a really pretty girl with very long golden curls and mystery in her eyes. Or…. She was a pretty girl with long golden curls and mystery in her eyes. Ask someone else to read your manuscript. Before you send your manuscript off to your editor, ask a friend or trusted colleague to read it. Ask them to note grammatical and spelling errors, typos and inconsistencies in book. Does the plot or story arc make sense to them? Does the story flow nicely? Is there a clear beginning, middle and end? If it is a nonfiction work, is the information presented in a way that is easy to understand? Reading your book out loud helps you slow down and use a different part of your brain to retrieve the information. You’ll find patterns of repetitiveness and things may not always make sense once you say them out loud. You don’t write like you speak and you make find several changes to make before you send it off to the editor. Remember, you’re sending your manuscript off to a professional to be edited. Your editor will help you to produce the best version of your book possible so that people will buy and enjoy it. You might think your work only needs copy editing, but that is never the case. The editors we spoke to stated that they all also edit for content and structure of your book (developmental editing). Keep an open mind and let your editor do the work you’ve trusted them to do. Want to see the interview with Joanna Penn and all of last year’s speakers? You can get the 2018 All Access Pass HERE for an amazingly low price. Our editorial panel included Liz Thompson, House Style Editing, Stacey Aaronson, The Book Doctor is In, Dakota Nyght, Editor and Content Creator , Jodi Brandon, Jodi Brandon Editorial, and Jenny Kanevsky, Editor and Copywriter. This panel discussion first appeared in our online publishing summit. To get on the waitlist for our upcoming free online publishing summit, subscribe below. Ditch the Fear and Just Write It! Download Your Free ebook now and get started writing that book!